Stache is next to the large live entertainment bar America’s Backyard in Riverwalk. Both clubs share the same owners. Stache caters to a customer more interested in the art of ‘art of mixology’ than just being inside a bar with live music and a large crowd such as America’s Backyard caters to. The video below is of Dan Ankroyd jumping on stage unannounced to sing with the Blues Brothers Soul Band while he was promoting a Vodka brand in the club. The staff is young and pretty and friendly. The club is busy on weekends and the decor is that of an old speakeasy. They have lots of well produced Youtube videos that get no views which shows they need help in social media marketing. 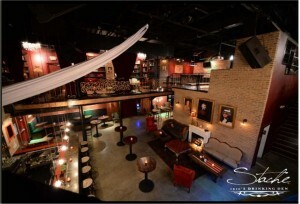 Stache also features live burlesque shows to go with the theme of the nightclub. Our staff rates the bar 4.5 out of 5 Stars.